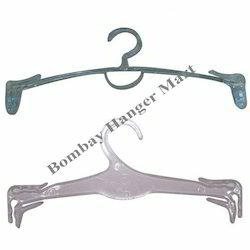 We are a renowned manufacturers and exporters of lingerie hangers and lingerie display hangers. Resistance to corrosion with fine finishing; these are offered at competitive prices. We also meet customized requirement for our clients benefit. We offer an exclusive range of Lingerie Hanger that are made of high quality products. These are noon-slip hangers and do not have any sharp edges that ensures that the delicate lingerie hangs safely. These can be used in homes or apparel & lingerie stores across the globe. These can be exclusively designed as per the requirements of our clients in different shapes, sizes and styles. Catering to the need of our clients, we offer an exclusive range of bra or Brassiere Hanger. These stylishly designed hangers are suitable to easily hang the delicate and expensive apparels of women. Made from optimum quality material, these hangers are available in various colors and sizes to befit the requirements of our customers.